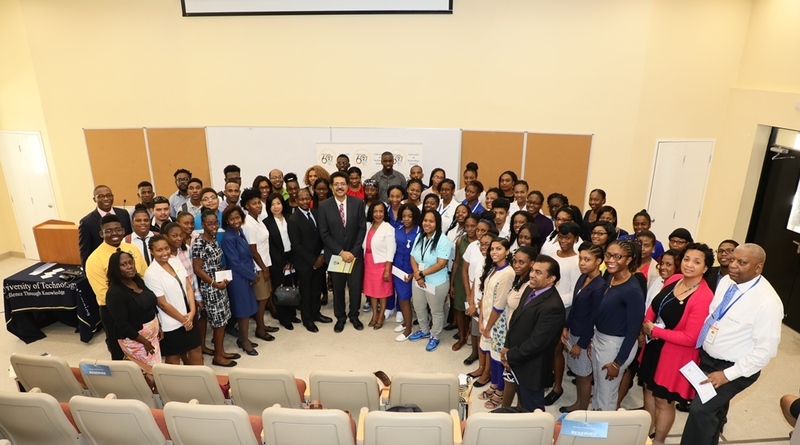 60 UTech, Jamaica Outstanding Students Awarded 60th Anniversary Scholarships — UTech, Ja. Professor Stephen Vasciannie (centre) President, University of Technology, Jamaica with Deputy President, Professor Colin Gyles (right of Professor Vasciannie), University Registrar, Mercedes Deane (left of Professor Vasciannie), Deans from the university’s various colleges and faculties pose for a group photograph with the 60 undergraduate students who were awarded the UTech, Jamaica 60th Anniversary Scholarship Award on January 25, 2019 at a presentation ceremony held at the Shared Facilities Building, Papine Campus. President of the University of Technology, Jamaica, Professor Stephen Vasciannie, on Friday, January 25, 2019 presented $6 million dollars in scholarships to 60 outstanding undergraduate students under “The University of Technology, Jamaica 60th Anniversary Award” scholarship programme as part of the institution’s 60th Anniversary celebrations. The scholarship, each valued at JS100,000.00 was presented to the academic high achievers selected from the University’s three Colleges and five Faculties, in a ceremony held at the University’s Papine Campus. The scholarships were awarded for one year only and were based on academic performance in Semester 1 of the 2018/2019 Academic Year. Each academic unit, with the exception of the Faculty of Law was asked to identify the top 8 students on the basis of the Grade Point Averages of 3.5 and above in Semester 1 of the 2018/19 Academic Year which began last August. In the case of Law, the top 4 students were awarded. The scholarship awardees were also required to be pursuing at least 9 credits in the Semester to be eligible for the award. Acknowledging that pursuing tertiary education “is not an easy road” with myriad challenges including financial and work and study commitments, the President applauded the high achievers for making the special effort in pursuing and achieving academic excellence. Professor Vasciannie encouraged the students to use their scholarship award to pay their schools fees or to purchase books to enhance their knowledge and academic output. The vote of thanks was moved by Professor Colin Gyles, Deputy President. He reiterated thanks to President Vasciannie and to the University’s Council and governing bodies for rewarding the University’s top achieving students. Professor Gyles also thanked the Deans, teaching staff and administrators from the various colleges and faculties for their dedication to teaching and motivating students and for facilitating the needed environment that is critical to students’ success. The Scholarship Award Ceremony was ably chaired by Dr. Kamilah Hylton, Dean of the Faculty of Science and Sport who kept the proceedings flowing with her signature flair and charm. Dean Hylton, in congratulating all the 60 awardees pointed out that they represent the top .5% of the student body of approximately 11, 500. 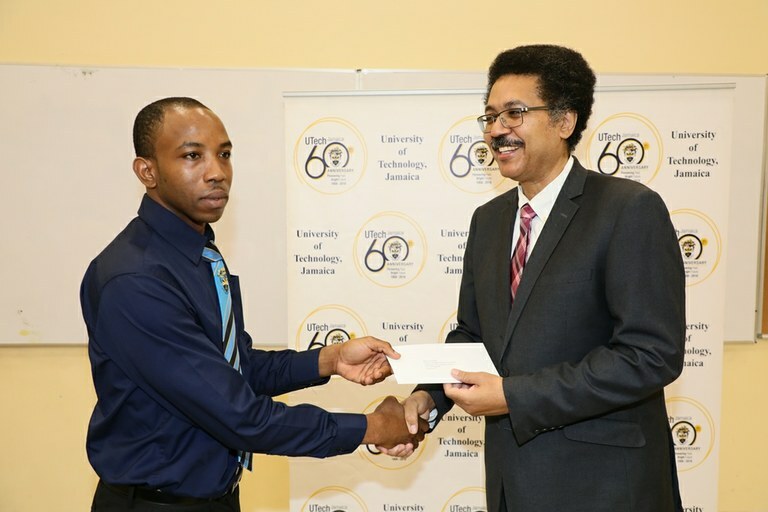 Perfect GPA: Professor Stephen Vasciannie (right) President, University of Technology, Jamaica presents high achiever Rayion Sawyers, undergraduate student in the Faculty of Engineering and Computing with the UTech, Jamaica 60th Anniversary Scholarship Award of $100,000. Sawyers, who is pursuing the BSc degree in Electrical and Computer Engineering attained a perfect GPA of 4.00. 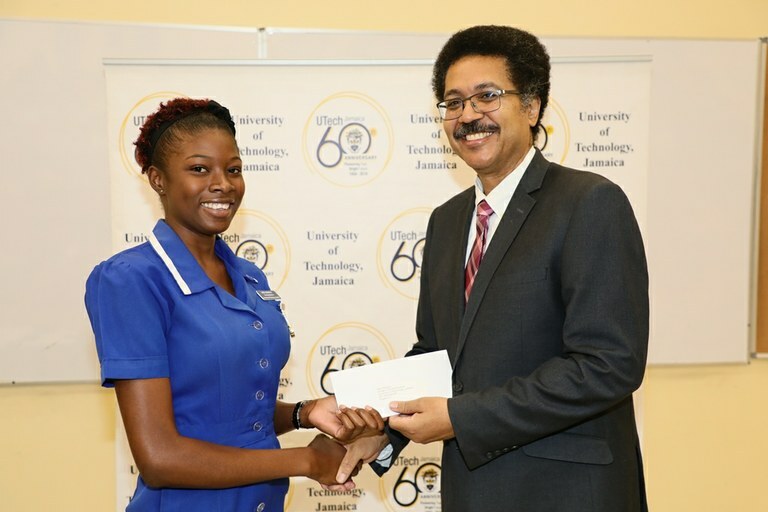 Professor Stephen Vasciannie presents high achiever Rita Simpson, student of the Caribbean School of Nursing, College of Health Sciences, with the UTech, Jamaica 60th Anniversary Scholarship Award of $100,000. Simpson who is pursuing the BSc degree in Nursing attained a GPA of 3.83. 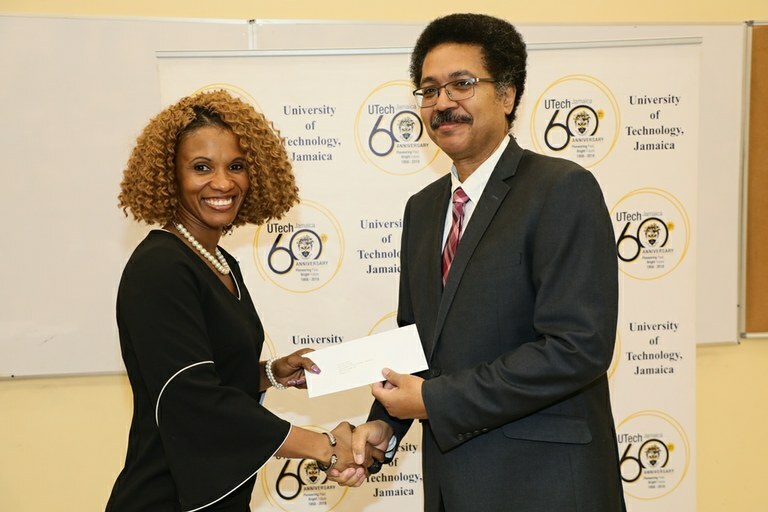 Professor Stephen Vasciannie, President, University of Technology, Jamaica presents Denise Allen, undergraduate student in the Faculty of Law, with the UTech, Jamaica 60th Anniversary Scholarship Award of $100,000. Allen obtained a GPA of 3.76.